CORPUS CHRISTI, TX – Camping is a wonderful way to spend time with family and friends and connect with nature. For many local families, celebrating Easter holidays at Labonte Park is a long-standing tradition with many fond memories to recount. We invite everyone to step outside and enjoy nature’s playground. 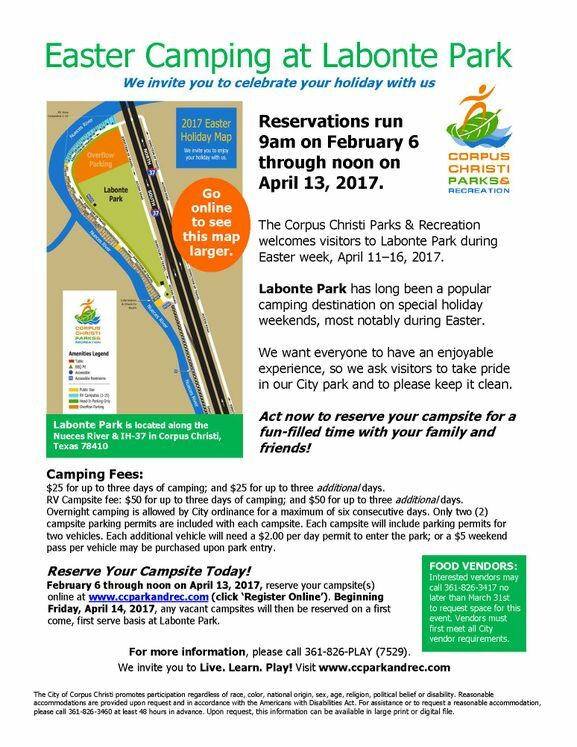 The Corpus Christi Parks & Recreation will start accepting online reservations from park visitors to secure camp site(s) at Labonte Park for the week of April 11–16, 2017. Labonte Park is located along Nueces River and is a very popular camping destination for special holiday weekends. Park visitors can be found casting a fishing rod for the catch of the day, playing a game of Frisbee, flying a kite, or throwing some fajitas, hotdogs and corn on the cob on the grill—there are so many ways to enjoy time in the park. We want everyone to have an enjoyable experience, so we ask visitors to take pride in our City park and to please keep it clean. The Camping Fee of $25 will be required for up to three days of camping at the park. A second $25 camping permit may also be purchased allowing for up to three additional days of camping. RV campsites are $50 for the first three days of camping and $50 for three additional days. Each campsite will include parking permits for two vehicles. Each additional vehicle will need a $2.00 per day per vehicle permit to enter the park or a weekend pass may be purchased upon entry for $5 per vehicle. Overnight camping is allowed by City ordinance for a maximum of six consecutive days. A day use permit for an individual campsite will also be $25. Camping Fees will offset the cost of trash pick-up and site clean-up required as a result of the holiday camping. RESERVATIONS: The online reservation period will run from February 6 at 9am until noon on April 13, 2017. Campsites are reserved and paid for in advance at www.ccparkandrec.com (click ‘Register Online’). Two campsite packages are allowed per customer request and payment must be made within 24 hours of reservation approval. Beginning on Friday, April 14, 2017, any vacant campsites may then be reserved on a first come, first serve basis at Labonte Park. The time is now to reserve your campsite to create memories with your family and friends! For more information about this event, please call the Corpus Christi Parks & Recreation Department at 361-826-PLAY (7529) or visit www.ccparkandrec.com. Interested food vendors may call 361-826-3417 no later than March 31, 2017 to request space for this event. Vendors must first meet all City vendor requirements.